I know I’ve been sparse around here lately but I have a good reason. I’ve just been enjoying life so darn much lately. And believeyoume, I’m as surprised as anyone since, you know, it’s Summer. Nothing against Summer of course, but generally there’s just so much togetherness. And trying to still work a full(ish)time job amid all the togetherness. And trying to maintain my sanity while working a full(ish)time job amid all the togetherness. Traditionally that has exhausted me, leaving me uber-cranky and ready to start packing backpacks and lunches three to four weeks before school actually starts. But not this year. As I’ve said before, I can sense we’re in our Golden Age and enjoying Summer is apparently one of the side effects. Can I get a Hallelujah? They attended day camp for a week and loved every second of it. In fact, Ephraim’s only complaint the entire week was that he couldn’t spend the night. And if you know our little guy, complaining is kind of his thing. Call it his spiritual gift. So coming home with next to zero complaints is HUGE. 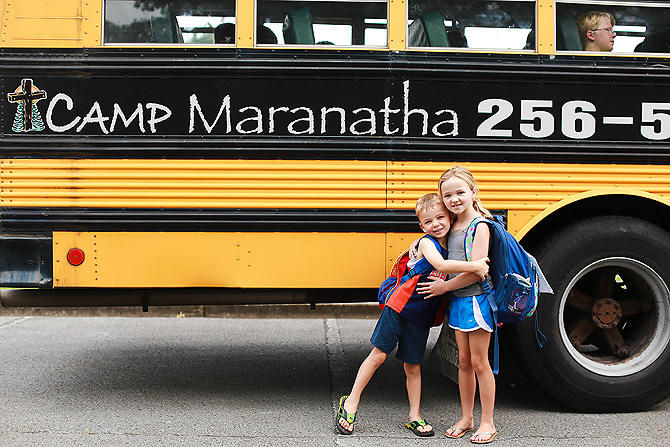 In fact, when Sarah flew to California and missed the last two days of camp he thought nothing of jumping onto that big ol’ bus without his sissy and conquering camp alone, even as the youngest kid in attendance. They’re both already plotting their camp week next year…and this time E is insisting he will be spending the night. Anyway, sorry for all my rambling but now you know where I’ve been. Just trying to soak up every moment with these constantly growing kiddos. We just got back from our friend reunion week in Isle of Palms so I’ll soon have pics to share of that. And I still have some stories to tell about our 4th of July with Brent’s family up in the mountains. So don’t give up on me just yet! phew.. i was having withdrawals. haha! They are getting big but they’re still so darn cute! Glad you’re having a great summer! enjoy, and we’ll be here when you get back!